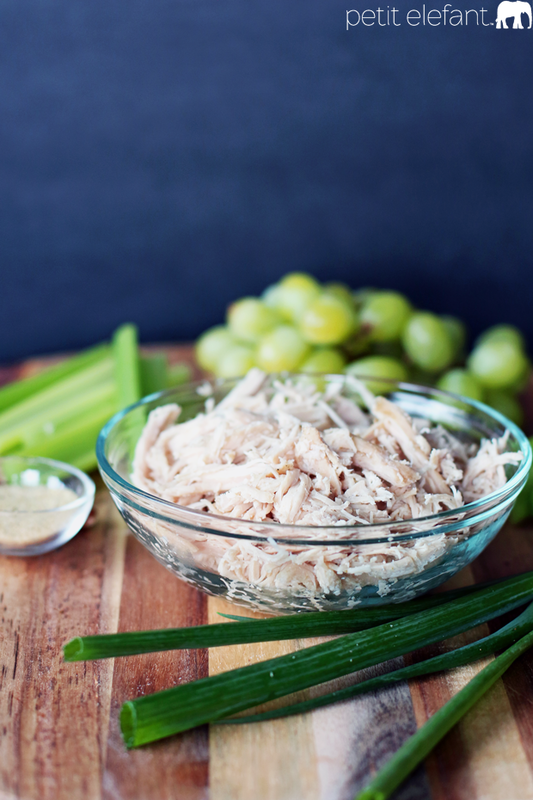 Chicken salad sandwiches are for dinner at my house tonight, so I thought I’d share my recipe for you to enjoy. This is one of my favorite quick + easy recipes for dinner, and it’s one my kids always love. 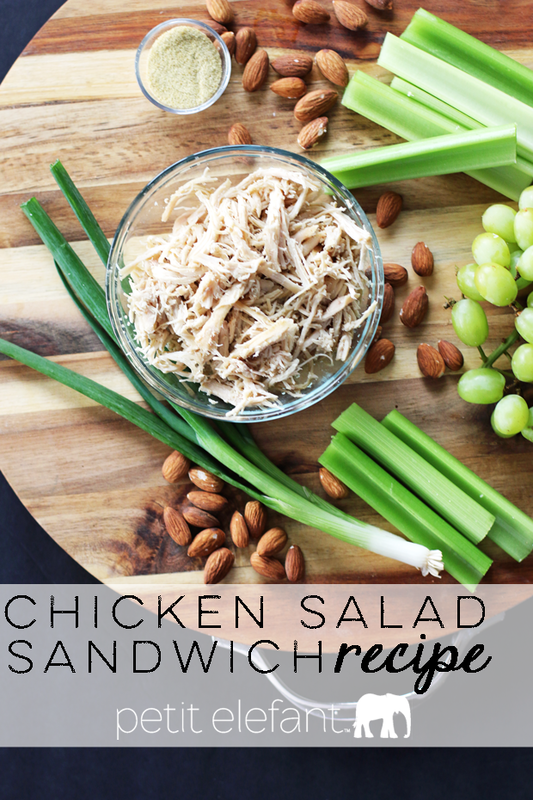 The best part is that most of the prep for this chicken salad happens in the crock pot while you’re at work / painting your nails / sleeping / at school / watching TV. Don’t you love crock pots? They’re miracles for all kinds of things, including hot chocolate bars and leftover Thanksgiving turkey reboots. And of course, shredded chicken for chicken salad croissant sandwiches. First, season the chicken breasts and put in the crock pot set to high for 5 hours, or on low for 7 hours. Once the chicken is cooking in the crock pot you can start prepping the rest of the salad. 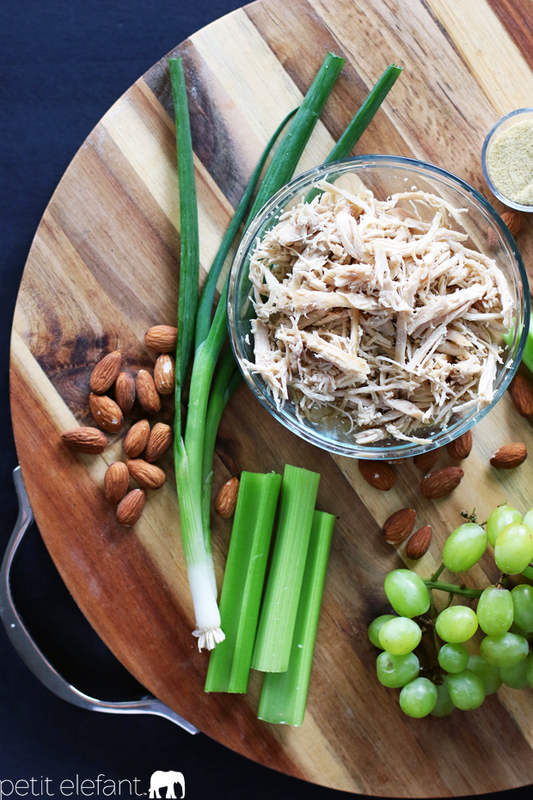 Chop the grapes, the almonds, and all the vegetables and set aside. Mix together the Greek yogurt and some seasoning salt (seriously, skip the mayo, no one will even notice!) and then add the grapes and the veggies. Put the whole mix in the fridge and go find something else to do for a few hours. Once the chicken is cooked, shred with a couple of forks and add to the bowl from the fridge. Chill completely until ready to serve. 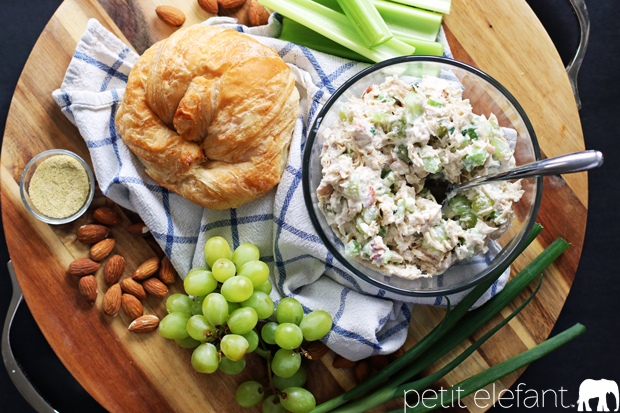 When it’s time to eat, slice croissants open down the middle and add chicken salad. This is a great recipe for a bridal shower, baby shower, weekend BBQ, or pot luck. Enjoy! Season boneless skinless chicken breasts with seasoning salt. Place the seasoned chicken breasts in a crock pot, cover with 3-4 cups of water, and cook on high for 5 hours. Once the chicken is completely cooked, shred with two forks and set aside. 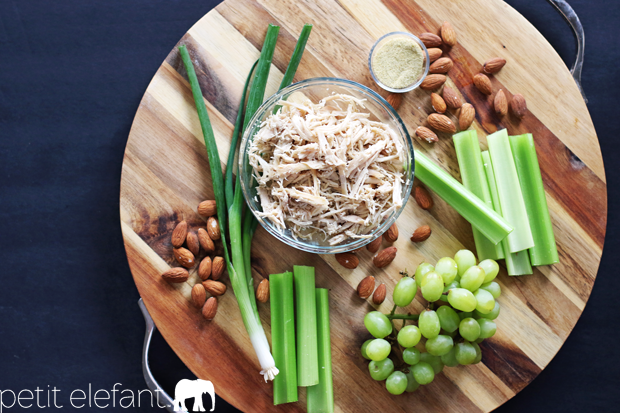 Chop green onions, celery and almonds. In a big bowl mix together mayonnaise (or Greek yogurt), lemon juice, and seasoning salt. Add chopped vegetables and grapes to the Greek yogurt (or mayonnaise) and mix thoroughly. Add shredded chicken to bowl and mix completely. When ready to serve, scoop chicken salad into sliced croissants.